If you’re in the market for a somewhat basic navigator that can help you get your bearings while you’re out and about, the eTrex10 by Garmin might seem a reasonable choice. It’s versatile, waterproof and rugged, it does what it’s supposed to do, and above all, it is highly affordable since it’s typically sold for less than one hundred and fifty. It uses both GLONASS and GPS satellites, so that means your location is discovered and maintained in a faster and more accurate manner. Let’s look at some features and benefits of this navigator. When it comes to whether this unit will stand the test of time or not, we’ll set your mind at ease by telling you that it probably will outlive many of your targets. It’s rugged and durable, and it has been found to be waterproof to IPX7 standards, which means that it will put up with the abuse of the elements and still give you the info that you need the most. Particularly because it doesn’t come with a host of features as some of the other hunting GPS units we’ve come across, the receiver of this one is responsive, loads up the info fast, and above all, it gets the job done. On top of everything, this device will tell you the sunrise and sunset times, it comes with a calendar, and it even has enough storage for fifty routes and about one thousand waypoints. We would advise backing up your data once you come back home, because you don’t have the convenience of upgrading the memory of this device since it comes with no SD card slot, so losing all that info would be a shame. The best thing about this product is that it can be used with disposable batteries. While some hunters might frown upon this apparent pro, the truth is that keeping a spare set in your backpack won’t weigh you down that much, and a single set can last you for as many as five days or more – depending on how much you use the device, of course. You can use the eTrex10 with just two AA batteries, and whether they are rechargeable or not, keeping four in your storage equipment isn’t that much of a hassle – at least, we don’t think so. The 2.2-inch display of this product might not necessarily be something to write home about, especially since it is monochrome. However, this feature makes the GPS reasonably small. You can conveniently and comfortably hold it in your hand, and the fact that it weighs in at just 5 ounces is another pro you ought to consider. It fits most pockets available in hunting jackets, so that’s another thing to bear in mind. 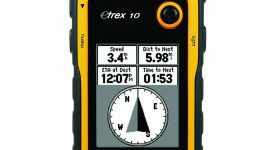 If you were to compare the eTrex10 with similar navigators, and even with its ‘bigger brother’, the eTrex 20, you’d find that it is somewhat basic. It has a low-resolution monochrome screen that’s on the smaller side of things. However, the screen is a great feature if what you’re looking to do is expand the device’s battery life so that you can use it for several days of hunting or hiking. Another aspect that might fail to impress you about this product is that it doesn’t accept any SD or other data cards, so you have to make do with what’s available on it. If you’d much rather use a color and higher performance alternative, perhaps you should consider one like the Montana or the Dakota developed by the same brand. 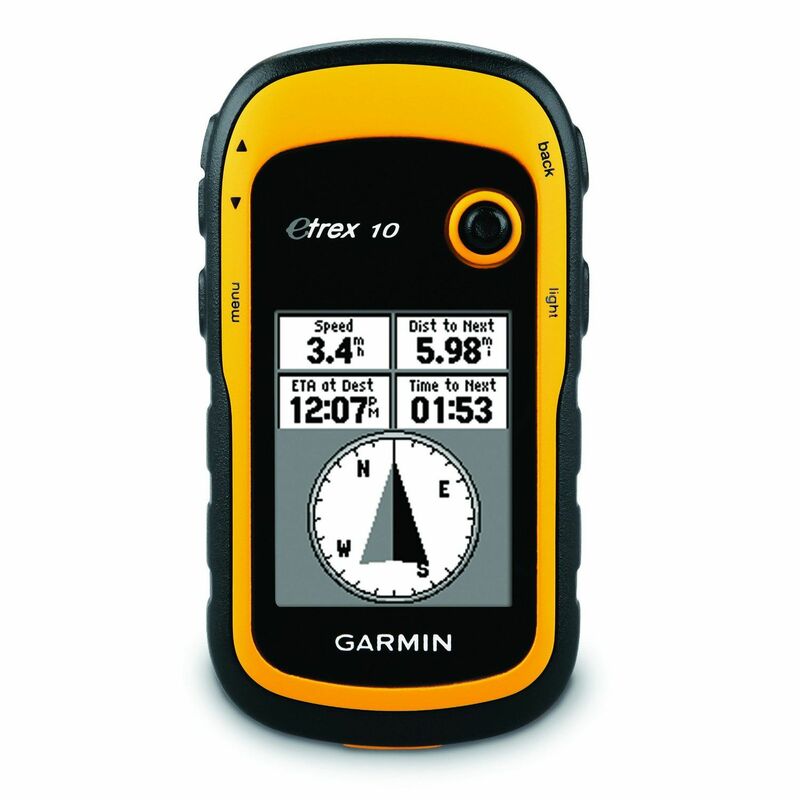 Similarly to other gadgets designed by this company, the eTrex10 is convenient and easy to use. The interface is also rather user-friendly, so that’s another aspect you ought to consider, especially if you have never used hunting GPS models before. If you do encounter any issue whatsoever, you’ll be glad to know that there’s a host of support from the Garmin website or third-party websites and blogs, since this isn’t a shady brand we’re tackling here. The tracking is also automatic and it uses little to no memory. Besides, marking waypoints is fast and easy, and it takes very little time. Many of those that have tried out this affordable alternative say that they are overall pleased with their choice, especially since the interface is easy to learn without the use of a manual.